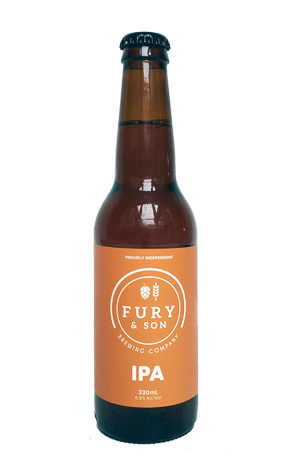 He may be a sucker for big, malty brews but, with a brewing CV that includes stints at IPA loving Mountain Goat and The Monk, where he tweaked their trophy-winning Chief IPA en route to winning a Champion Brewery title, it's fair to say Fury & Son's head brewer Craig Eulenstein knows his way around an IPA. And it's the rampantly popular beer style – just see the size of our two-part IPA Blind Tasting to see how many are being produced locally now – that joins the New World Pilsner and American Pale Ale as the Keilor Park brewery's third core beer. Hops wise, it's an all American affair – mainly Citra and Calypso with a touch of Chinook for the brewers among you – although such is the breadth of characters being found in some newer hop varieties from all parts of the globe, these contribute flavours reminiscent of some of our local varieties too. Orange citrus and pine lead things on the aroma side (with Craig promising to make these sing more as he tweaks the beer over time), while flavours are more of the tropical, grassy, fresh hop sort, balanced by a slightly sticky caramel malt base (that, again, Craig, plans to make leaner for batch two). It's a beer that sits lightly on the palate for one that's close to 7 percent ABV and gives lupulin lovers another option when choosing how next to tantalise their tastebuds.